Berry season is here! 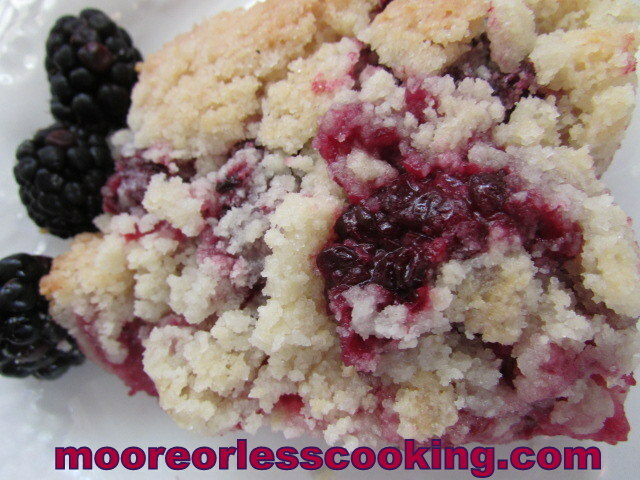 I love baking with blackberries, the flavor is so delicious. 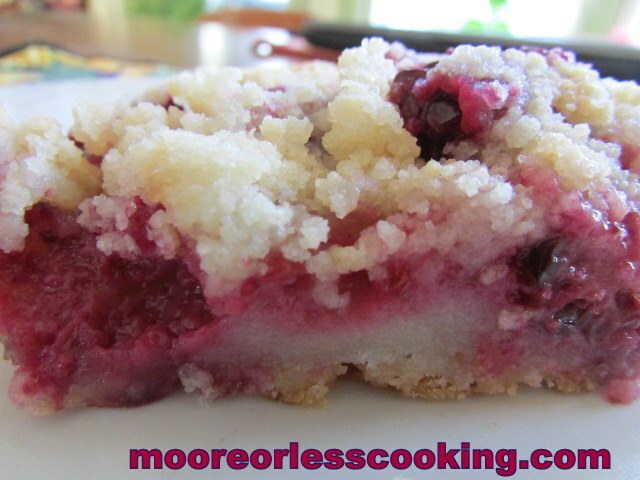 Berry pie is my favorite dessert, so I imagined a berry pie bar would be even better. You can hold it in your hands and eat it, but I won’t judge if you use a plate and fork. I had to try a couple of these bars, I just couldn’t believe how delicious they are. So excited when a recipe works out this well. This is going to be a favorite summer bar. I can imagine blueberries or peaches or strawberries would be amazing too. Cover baking pan with foil, spray pan with Pam. Pie bars are my new best friend, trust me, you will love these bars. Make the crust by adding to the bowl of a food processor the flour, sugar and salt. Pulse for about 30 seconds to combine ingredients. Add the cubed cold butter and pulse until the butter pieces are about the size of peas. Remove 3/4 cup of the mixture to use as a topping and set aside until needed. Pour the rest of the crumb mixture into prepared pan and press into pan. Bake for 12-15 minutes or until the edges begin to turn golden. Cool completely. Make the filling by mixing together, in a medium bowl, the eggs, sugar , sour cream, flour and salt until well combined. 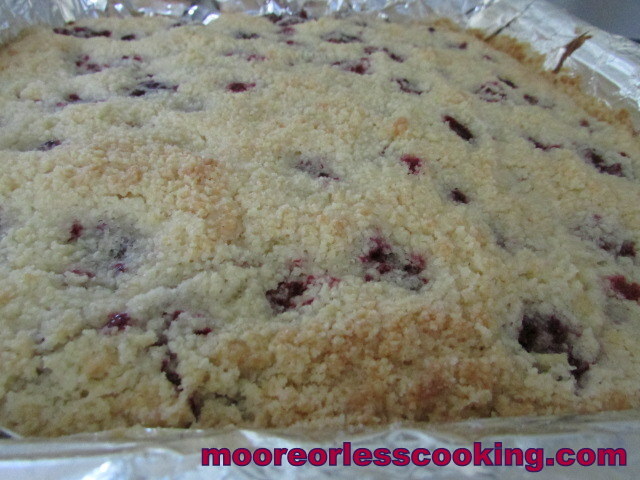 Spread the berries in a single layer on the cooled crust. Spoon the filling batter over the berries. Evenly spread the reserved crumb mixture on top of the filling. Bake for 45-55 minutes, or until the filling is just beginning to turn golden and is set. Cool bars completely on a baking rack then refrigerate if desired. Oh, don’t these look wonderful! I can’t wait to try them with huckleberries, too! Blackberries are my favorite berry, they remind me of picking them along the country lanes as a child in England. This is a lovely dessert. I cant wait for our blackberries to come to make desserts like this. I can’t get enough of blackberries either, hope you get a chance to try them Tipsy! 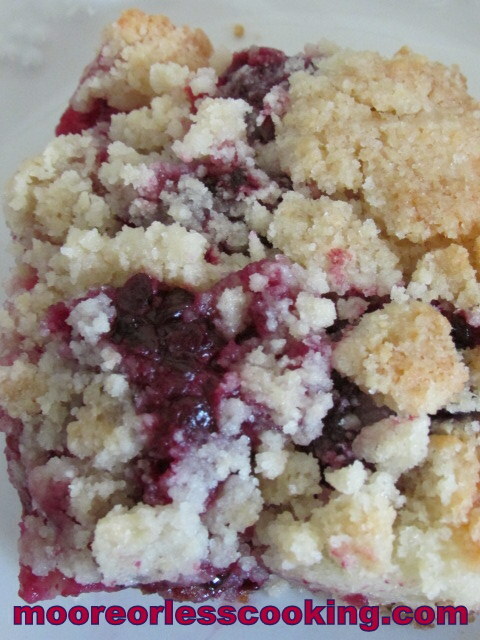 Our blackberries will be going into this lovely, delicious recipe by summers end! Pinning! These looks absolutely delicious Nettie and wish I could have some right now with my coffee! 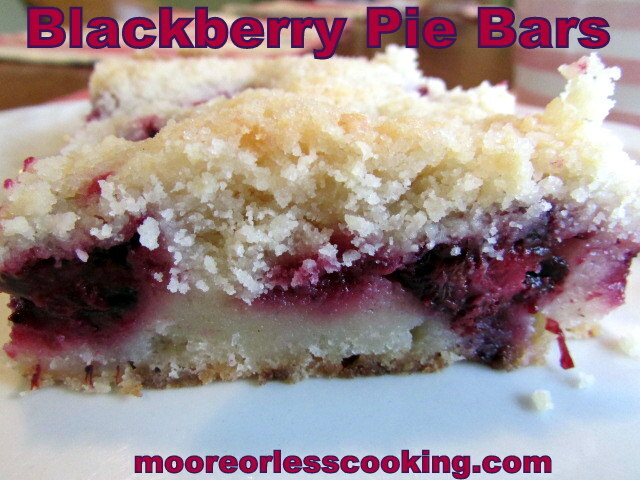 These blackberry pie bars are calling my name! Looks so scrumptious! These bars are just gorgeous! Don’t these look like a slice of heaven! I love blackberries! Oh they look fabulous. Love that topping. Could almost reach in and grab a slice.